Heartin, I want to know when is the right time to start reading this book? I mean what are the prerequisites? I have learned Java SE and now I am beginner in Java EE. Could you provide me roadmap to reach this book? Excuse me, which book do you mean? The blog "Heartin"? Okay, you meant the Serverless Programming Cookbook by Heartin Kanikatotu. 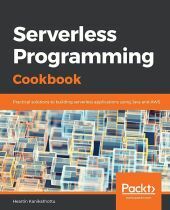 Angus Ferguson wrote: Okay, you meant the Serverless Programming Cookbook by Heartin Kanikatotu. The book is for people with no prior knowledge of AWS and starts with AWS account creation. But some knowledge of Java is good to have since I have used Java as the programming language to write AWS Lambdas (you already have that knowledge as you have mentioned). That said, most other recipes use either AWS CLI commands or CloudFormation templates and is programming language independent. You can implement the APIs and flows in any programming language you are comfortable. Enough theory is provided with most recipes (including HTTP and REST essentials). Book covers following AWS components from basics or as a continuation of previous recipes: AWS Lambda for FaaS, DynamoDB for backend, API Gateway for REST APIs, Cognito for user management, Route 53 for DNS management and domain registration, CloudFront fo CDN, AWS Certificate Manager for Certificate generation, S3 for static website hosting, SNS for notifications, SQS for messaging, Kinesis for data streams, Amazon ML for ML, Alexa for NLP and CloudWatch for monitoring. Finally, the book also gives you getting started guides for FaaS in Azure, Google Cloud and IBM Cloud. Even after all this if you need further help, I am always available to help on any queries through Linkedin / my blog. For beginners who come to me with a little or no programming language experience, I even provide a welcome kit with enough support materials (and previously answered questions) to get started. As I mentioned in another post, I believe that my responsibilities as an author in not over after publishing the book. Iron Clad Java for beginners? Finished with beginner stuff... what now? Beginner in Java, what are the good books?